M Night Shyamalan has a talent for bringing a different type of performance from well-known, sometimes arguably type-cast stars. The Sixth Sense gave a different side to Bruce Willis while Unbreakable reminded people that Samuel L Jackson could actually act. In Signs, he does the same for Mel Gibson. Nobody sees “retired priest” and immediately thinks Gibson (unless that priest is getting revenge in a bloody but quite comical way). Here, Gibson must give a calm, unassuming and almost quiet performance as the head of a household fighting both inner turmoil and possibly threats from outside as it appears aliens are invading Earth. Shyamalan places the extraordinary into the everyday world. This brings the second talent Shyamalan has: making the extraordinary ordinary. Having managed to ground both ghosts and superheroes in reality, pulling the same trick with aliens could have been a difficulty. 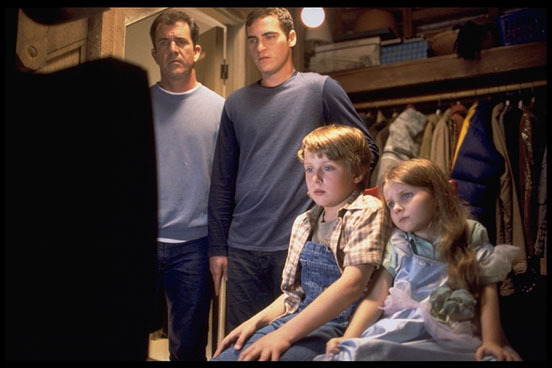 Luckily, Shyamalan manages it well, mainly by focusing on the smaller scale impact and how an event like this would effect one family, in one house. This family has a stellar cast to pull off the impact. 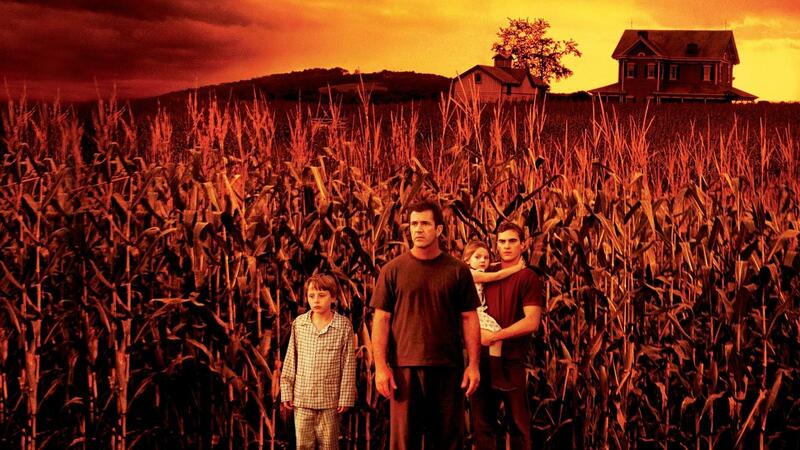 Gibson is head of the household, while he his helped by his disgraced brother, Joaquin Phoenix. The kids are the real stars here though and both manage to steal the movie, from older son Rory Culkin to young star Abigail Breslin. How effectively they manage to sell the event is what makes Signs so compelling. It also helps develop tension in what could be mundane moments. A baby monitor *possibly* picking up alien transmissions, the strange reaction of family dogs, a late-night walk through a corn field or an encounter under a pantry door: all of these could have been inconsequential but here feel as scary as any horror set-piece and just as effective. Which is why Signs works. It isn’t a horror movie in the traditional sense but you will find yourself unnerved. It has traditional scares but with them are more psychological moments, which will make you wonder how well you’d survive an encounter as strange as this one. Which is why it is more disappointing when the film has to have a “pay-off.” Like any good sci-fi/horror villain, sometimes less is more and the movie unravels when it starts to go down a more traditional route. It also suffers from a strong desire to link events and push home a sentiment regarding faith which works in some ways but becomes completely over-played by the end. 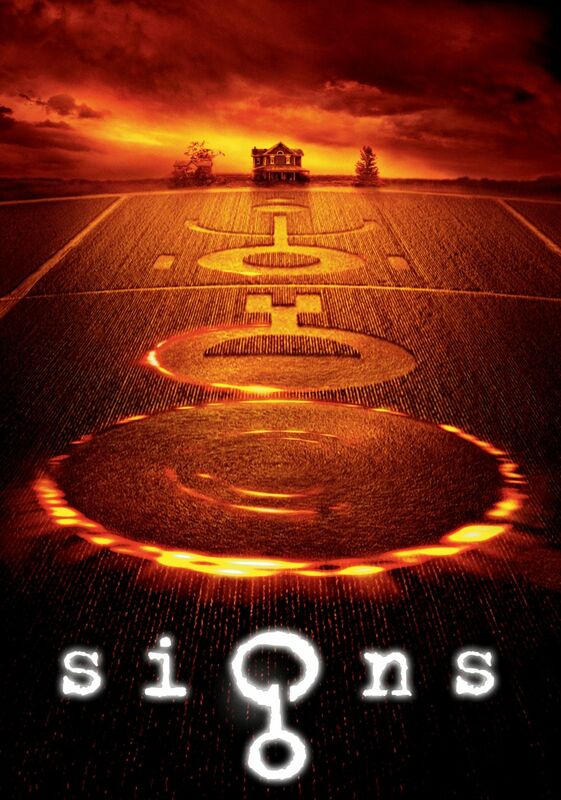 Overall, Signs is an effective sci-fi horror without being outright scary or outright science-fiction. By focusing on a small family, unassuming and normal, it makes the horror feel much more real and the inconsequential moments feel grand. Unfortunately it suffers from trying to make moments too convenient but is never less then a thrilling movie. To this day, I really like this movie. And that baby monitor scene always freaks me out. Me too. There were some genuinely unnerving and terrifying moments here.